Rock & Rule is an animated film that I initially planned on including in my retrospective on the films of the Summer of ’83, but didn’t get to in time. Although it had a theatrical release in Canada in August 1983, it had a very limited release in the U.S. but developed a cult following when it ran on cable TV. It’s amazing how vividly I remembered Rock & Rule even though I only saw it once in my life prior to this week’s screening, and that was back around 1985 on cable TV during a marathon game of Dungeons & Dragons. The details and the quality of the film stuck with me over the years, and each time I watch a traditional hand drawn animated film, I’ll measure it up against Rock & Rule. Fading rock superstar Mok (who looks like he was modeled after Mick Jagger and/or Keith Richards) travels the world seeking the voice that will sing the Armageddon Key and open a doorway to the underworld. He finds that voice in Ohmtown, where bandmates Angel, Omar, Dizzy and Stretch play an empty dive club. Mok invites them to his mansion, drugs Omar, Dizzy and Stretch, and kidnaps Angel when she refuses to leave her band. Angel’s bandmates snap out of it and follow Mok’s zeppelin to Nuke York to save Angel. This film was better than I remembered, and what struck me the most about Rock & Rule when I screened it this week was how the film’s production hit on all cylinders. The animation and photography of Rock & Rule combined classic techniques developed by Disney in the 1940’s with the state of the art computers available in the early 80’s. But what’s most impressive is the level of musical talent associated with Rock & Rule. Debbie Harry. Lou Reed. Cheap Trick. Earth Wind & Fire. Iggy Pop. None of them could be accused of phoning it in for a cartoon. They went all out in the songs they contributed, and their enthusiasm for the film is evident in the documentary The Making of Rock & Rule. I only have one criticism of the film: the animation of the characters in the scenes in which they were singing had a lack of movement that took away from the energy of the music. When I think of the animated films I’ve enjoyed over the years, several that immediately come to mind are Heavy Metal, American Pop, Watership Down and Fire & Ice. As much as I still enjoy each of those films, Rock & Rule holds up better than all of them thirty years later. It had great animation, a cool score, and a great soundtrack. Unfortunately for all of this praise, the reality is that Rock & Rule didn’t find a theatrical audience due to lack of interest by U.S. distributor MGM. But despite the lack if distribution and low box office, 30 years later Rock & Rule is still well crafted movie and a must see for fans of animation. Fante’s Inferno celebrates summer movie-going by revisiting the films of the Summer of ’83. It’s fitting that I’m winding down my retrospective on the films of the Summer of ’83 with Fire and Ice because it was the last film I saw in theaters as that summer ended. With that screening in the final week of August 1983, two and a half months of movies, comic books, video games and hanging out with friends segued into to the beginning of the upcoming school year. Watching Fire and Ice again this past weekend not only brought back the memory of that last week of summer vacation, but also how the film and Frank Frazetta’s artwork influenced me at the time. The film is about the war between the evil Queen Juliana of Icepeak and King Jerol of Firekeep. Juliana and her son Nekron cover the earth with a wave of glaciers, decimating Jerol’s army as it inches closer to overtaking Firekeep. Juliana and Nekron send a delegation to Firekeep under the guise of eliciting Jerol’s surrender, but kidnap his daughter Teegra in order to force her into a marriage with Nekron. Teegra escapes from her captors and meets Larn, a survivor from Jerol’s army. Teegra is recaptured by Juliana and Nekron’s sub-humans, and Larn attempts to rescue her from Icepeak with the help of Darkwolf. There’s surprisingly little dialogue in the film’s 81 minutes, but the action is non-stop. Fire and Ice gives life to the fantasy worlds depicted in Frank Frazetta’s incredible paintings (in one shot in the film, Darkwolf is reminiscent of Frazetta’s iconic painting of the Death Dealer), and the animation techniques used in of Fire and Ice blew me away back in 1983. All of the character action was rotoscoped – live action was filmed, then each frame traced onto animation cels, lending a more “realistic” effect to the animation. This film is one of the reasons I still prefer hand-drawn animation over today’s computer generated animation, and I enjoyed watching The Making of Fire and Ice for the parts of the behind-the-scenes film that show the process of rotoscoping as Bakshi directed live actors in the scenes that would be traced for the final animated sequences. Watching it again made me wonder why Bakshi et al didn’t include more scenes with Darkwolf. Each of his scenes brought out more of the Frazetta-esque feel, heightening the action and excitement of the film, especially going into the final battle at Icepeak. The character of Teegra is drawn in the classic Frazetta style seen on many a fantasy novel cover. Watching Fire and Ice this past weekend, I laughed when I remembered that during my second screening of the film in August 1983 the projectionist intentionally made one scene between Teegra and Larn out of focus because my friend Rob and I were the only people in the audience and he didn’t think it was appropriate for two eleven year olds to watch. I was impressed at the level of talent involved in Fire and Ice’s production: director Ralph Bakshi had a strong track record of films prior to Fire and Ice (Fritz the Cat, Wizards, American Pop, The Lord of the Rings, Heavy Traffic, Hey Good Lookin’), Frank Frazetta was the absolute master of fantasy art, and writers Roy Thomas and Gerry Conway had written great comic book stories for Marvel and DC. But the names that truly surprised me in my research were those of two of the film’s background painters: James Gurney (Dinotopia) and Thomas Kinkade. The August 1983 release of Fire and Ice also coincided with my first attempts at picking up a paint brush. My two favorite paintings by that time were Michelangelo’s Sistine Chapel and Frank Frazetta’s The Silver Warrior. My weekly routine included checking out the fantasy and science fiction sections of our local Waldenbooks, and it’s safe to say most of my paperback book purchases were based on the cover paintings more often than by the author or story. I can’t imagine how many hours of the Summer of ’83 I devoted to buying art supplies at the old Larchmont Art Shop and sitting at my drawing table with a set of acrylics and canvas boards trying to copy the works of Frank Frazetta and Bill Sinkiewicz in the hopes of one day painting covers to fantasy novels and comic books. What I would give to relive one of those carefree summer days again. National Lampoon’s Vacation is one of the films that I looked forward to the most going into this retrospective. Even though I tend to concentrate on fantasy, sci-fi and comic book films I have to include a classic comedy now and then. There are movies that you enjoy, there are movies that you watch many times over, but every so often there’s that one movie that you just seem to empathize with. National Lampoon’s Vacation is one of those movies, and 30 years later it still gets an audience to laugh at its classic scenes and cringe at the memories they bring back of our own summer family vacations. I’m sure most folks over the age of 40 hear a few bars of Lindsay Buckingham’s Holiday Roads on a long distance drive. The film has great cast led by Chevy Chase and Beverly D’Angelo, but it’s the supporting actors in their cameos that add the extra layers of humor that keep the laughs going: James Keach as the highway patrol officer that goes from threatening to crying in a scene that is both hilarious and just wrong at the same time, John Candy as the Wally World security guard dragged into Clark’s breakdown, and Randy Quaid as Ellen’s ne’er-do-well cousin Eddie that suckers them into driving Aunt Edna from Kansas to Phoenix. It was a treat to see comedic icon Imogene Coca as Aunt Edna in Vacation, but her role provided only a fraction of the comedic gold she brought to TV viewers on Sid Caesar’s Your Show of Shows in the 1950’s and I wish there was a little more written for her. But the scene stealer throughout the film is Clark’s muse of the road played by Christie Brinkley. Is there anything more 80’s than Christie Brinkley and a red Ferrari? In under two hours, director Harold Ramis is able to pack in urban plight, teenage drug use, underage drinking, animal cruelty, death and a midlife crisis on the Griswold family’s road trip to Wally World. John Hughes’ screenplay was based on his short story Vacation ’58, and soon after his career as a director would explode with 80’s teen classics like Sixteen Candles, The Breakfast Club and Ferris Bueller’s Day Off. The running gag in the subsequent three Vacation films (European Vacation, Christmas Vacation and Vegas Vacation) was the casting of different actors to play Rusty and Audrey. Anthony Michael Hall and Dana Barron will always be the Rusty and Audrey movie fans will remember, and it would have been fun to see them reprise their roles in European Vacation. Barron was supposed to return as Audrey in the second film, but when Anthony Michael Hall had a conflict starring in Weird Science (also directed by John Hughes), the role of Audrey was re-cast as well. Overall National Lampoon’s Vacation was as I remembered it, although the pace felt a little slower this time around. And while each scene made me laugh and gain a greater appreciation for the Ramis and Hughes’ style of humor, my older self began to see Clark in a different light. He was no longer just that nerdy dad who’s best intentions tend to make everything worse. At the end of the day, Clark goes through each of those great lengths, much to the chagrin of his family, just to bring them all closer together and have them experience a little bit of fun that they might remember when they’re older. And watching National Lampoon’s Vacation again 30 years later, I simply smiled and looked forward to the day I’d be behind the wheel of my own version of the Family Truckster, family in tow, on a quest for fun. 30 years later, these words spoken by Joshua still have a chilling resonance. I’ve seen John Badham’s Wargames at least 20 times since my first screening at the Larchmont Theater in June 1983. It’s one of my favorite films of that particular summer and a perennial favorite since. Watching it again this week reminded me not only of what a great film WarGames is, but also of how it coincided with my Golden Age of computing in the 80’s. Back in 1983 the green text on the black monitor of my school’s TSR-80 was as high tech as it got for me (until I moved up to the Commodore 64 and its Royal Blue start screen), but I really enjoyed the days of playing the Infocom classics (Zork, The Hitchhiker’s Guide to the Galaxy, Planetfall, Ballyhoo), Montezuma’s Revenge and Trolls and Tribulations. WarGames is a time capsule of early 80’s computing, but the film still keeps me on the edge of my seat down to the final minutes. Even with a young Matthew Broderick as the protagonist WarGames doesn’t feel like a teen adventure and holds its own as a well made Cold War thriller. WarGames begins in the bunker of a nuclear launch site as two launch technicians (played by actors Michael Madsen and John Spencer) arrive for their shift. Their arrival at the launch facility is no different from any two average Joes arriving at the office for a day’s work. But once the alarm sounds, they methodically go through the launch procedures, checking and confirming codes until they learn they must deploy the nuclear warhead. Spencer’s character hesitates, and the scene ends with Madsen’s character holding up his revolver to get his partner to comply with their orders. It’s soon revealed that the launch sequence was a test by higher ups to gauge the success rate of the crews following through on their orders to deploy their missiles. Chief engineer John McKittrick (played by Dabney Coleman) uses this as an opportunity to install a supercomputer (the WOPR – War Operation Plan Response) to take the place of launch technicians and provide a failsafe against the possibility of human hesitation. I recently took a trip to South Dakota with my faithful sidekick, and coincidentally one of our stops was the Minute Man Nuclear Missile Site near the Badlands national park. Unfortunately the tour of the launch site was booked for the day, but we got to see a picture of it in the visitor center. It looked exactly like the launch facility in the opening scene of WarGames so I asked the Park Ranger on duty that day if any films were shot there after it was “retired.” She advised that the site has never been used as a movie location, but launch facility set created for WarGames was accurate and identical to Minute Man. With the exception of Michael Madsen pulling out a gun on John Spencer, even the launch sequence in the film was accurate. Enter David Lightman (played by Matthew Broderick), a high school student and computer whiz who would rather use his talents as a hacker than apply himself in school. He purposely gets his teachers to send him to the principal’s office so he can look up the passwords to their network and hack into their system. During dinner with his parents, he learns that computer game company Protovision will be releasing a new line of games. David can’t wait for them to be released, so he attempts to hack into their network and get early access to the games. After days of research and long nights trying to crack Protovision’s network through a back door in the system, a benign remark by his friend Jennifer (played by Ally Sheedy) provides David with the logon and password he needs to break in. But instead of hacking into Protovision, David has unwittingly hacked into the WOPR (also known as Joshua). He is greeted by Joshua, who thinks that David is his creator Dr. Stephen Falken, and suggests a game of chess. David insists on playing Global Thermonuclear War, however the “game” is actually the program used by the WOPR to simulate nuclear attacks. David and Jennifer’s game sets off alarms at NORAD, and the staff headed by McKittrick and General Berringer (played by Barry Corbin) believes they are under nuclear attack by the Soviet Union. The “threat” disappears when David shuts off his computer, and NORAD quickly learns that it was only a simulation. They track the break in from David’s hometown of Seattle. David quickly realizes the gravity of the situation when the simulated attack makes the evening news. He disposes of the evidence but is still being contacted by Joshua. The FBI takes David in for questioning at NORAD, but despite his insistence that he thought he was simply playing a game, McKittrick doesn’t believe his story and has him detained on suspicion of espionage. He uses his tech savvy to sneak out of NORAD (which requires a little suspension of disbelief) and sets out to find Dr. Falken (played by the great John Wood) and prevent Joshua from starting a nuclear war. What still makes the story accessible despite the dated equipment is Badham and Broderick’s representation of the fun and blank slate of the early days of home computing without dumbing it down with unrealistic graphics. One of the caveats I’ve always had with computer/tech themed films is how the functionality of computers, networks, etc. are “jazzed up” to make computers more cinematic. There’s a little bit of that with regard to David’s conversations with Joshua, but the simple typed lines of text typed onto an old school monitor ensure that WarGames doesn’t overachieve with regard to the functionality of early computers. I already had a DVD copy of WarGames when the 25th Anniversary DVD was released in 2008. Normally I would have been happy with my first copy, but this new edition had a Making Of featurette that made the purchase a no-brainer. Despite my appreciation for WarGames and its rank among my all time favorites, I hadn’t actually researched the making of the film. I didn’t know that John Badham had replaced Martin Brest (director of Scent of a Woman and Meet Joe Black) early in the film’s production. Badham had received acclaim for the era defining 70’s classic Saturday Night Fever and had another hit film, Blue Thunder starring Roy Scheider released one month prior to WarGames. Brest had Broderick and Sheedy initially playing their roles with a darker tone, but fortunately Badham lightened it up. The beginning of the film needed the infusion of teenage innocence and cluelessness in order for the story to unfold more effectively. The playfulness in Broderick and Sheedy’s early scenes really add to Broderick’s performance when McKittrick’s mistrust and threats hit David in the gut. But one piece of information about the production that truly blew me away was how the producers had originally considered John Lennon to play the role of Dr. Stephen Falken. While I think WarGames was near perfect as is, it would have been amazing to see how Lennon would have played the role. Screenwriters Lawrence Lasker and Walter F. Parkes’ tight story combined with Badham’s direction and a fantastic, believable cast takes the audience on a great ride down to the final moments of the film. WarGames made me and my brother beg our father to buy our first computer. I still remember the day he drove us to Caldors department store and completely trusted us to make that purchase without balking at the price. The Commodore 64 required a keyboard and disk drive purchased separately, and your TV would be the monitor. The salesman asked if we also wanted the modem to go along with it. I instantly thought of David Lightman using his modem to hack into Protovision. Fortunately we didn’t add the modem to our purchase and we stayed at Defcon 5. I had such a great time revisiting the films of the Summer of ’82 last year that I actually experienced withdrawal when I completed the retrospective. Each week I looked forward to screening an old classic from an amazing summer, allowing me to not only revisit each film with a fresh perspective, but also to relive the excitement of many a weekend spent in the local movie theater with a large coke and a pack of Twizzlers. I wanted to write another summer movie retrospective but wasn’t sure I would be able to find another lineup of films that could compare to what is considered the greatest movie summer for fantasy and sci-fi fans (I can’t think of another summer that had anything close to the number of fantasy and sci-fi films we were blessed with that year). I then decided not to approach a new retrospective in comparison to last year’s on the Summer of ’82, but rather as a nostalgic celebration of summer movie going as a whole. My reviews will focus mainly on the scifi, fantasy and thriller genres. First up will be the classic 80’s Cold War thriller WarGames! Recently I opened up the old box o’comic books and rediscovered an old favorite of mine from the early 80’s: Cloak and Dagger #1 from the 1983 mini-series written by Bill Mantlo and drawn by Rick Leonardi and Terry Austin. 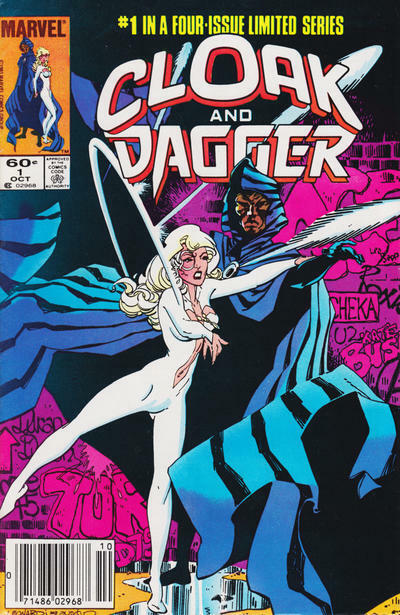 Cloak and Dagger, introduced in Peter Parker the Spectacular Spider-Man #64 (March 1982), were created by Bill Mantlo and artist Ed Hannigan. Runaways Tyrone Johnson (Cloak) and Tandy Bowen (Dagger) meet in New York City and are tricked by an offer of shelter from strangers that prey on runaways. Tyrone and Tandy are forced to take a synthetic version of heroin, and the side effects of the drug provide them with their superpowers: Cloak creates a dimension of darkness in which he can consume people’s energy to feed his “hunger,” Dagger creates and shoots daggers of light that drain the energy of her enemies and are also used to feed Cloak’s constant hunger. The first of the four issue Cloak and Dagger mini-series opens with a splash page of the New York Port Authority on the corner of 42nd Street and 8th Avenue. It’s July 20, 1983 and the neighborhood in the opening pages bears little resemblance to the Hell’s Kitchen/Times Square of today. Father Francis Xavier Delgado, a priest born and raised in Hell’s Kitchen, walks among the pimps, prostitutes and lowlifes of the neighborhood in an effort to save them. That night’s attempt proves fruitless and he returns to the Holy Ghost Church on 42nd street. He kneels at the altar of the empty church praying for God’s guidance when Cloak and Dagger appear seeking sanctuary. Several blocks away at the 21st Precinct, Detective Brigid O’Reilly observes a group of “chickenhawks,” lowlifes that victimize newly arrived runaways at the Port Authority, as they shiver in a jail cell. Doctors and cops have seen others in their condition and chalk it up to bad drugs, but when questioned by O’Reilly, one of the thugs tells her about the “angel” of light and “devil” of darkness that put them in their condition. O’Reilly connects their story to reports of vigilantes attacking criminals and drug pushers, then takes to the streets of Hell’s Kitchen. After a debate with Father Delgado over the ethics of their “mission” to punish the criminals that prey on runaways, Cloak and Dagger attempt to save a pair of brother-sister teen runaways from a group of chickenhawks. Gunfire leads Detective O’Reilly to their lair, but before she can act, a stray bullet strikes and kills the brother. Dagger’s light makes quick work of the lowlifes, but O’Reilly refuses to accept their methods. To her, Cloak and Dagger’s methods make them no better than the criminals. She attempts to arrest them, but Cloak teleports them back to the Holy Ghost Church. Later that night, Father Delgado sees Dagger in tears as he takes a phone call from the 21st Precinct requesting last rights for the dead runaway. It was usually the art that would draw me to a particular comic book, and this was no exception when Cloak and Dagger #1 hit the stands in 1983. Seeing Terry Austin’s name on the cover was all I needed to plunk my 60 cents on the counter to buy this issue. His inks were a great match for Rick Leonardi’s pencils, and an original page from this mini-series has always been on my want list. But it was Bill Mantlo’s writing, particularly his use of 1983 New York City as a backdrop, that got me to buy the subsequent three issues of this mini-series. Combined with Leonardi’s pencils and Austin’s inks, Cloak and Dagger brought the seediness of early 80’s Hell’s Kitchen to the comic book page. Looking back, I’m surprised at how much of that atmosphere they were able to include in their stories. This was a comic book with a significant readership under the age of 18 that showed pimps, hookers and drugs. These were dark stories for the time, years before “dark and gritty” would become overused in comic book stories.